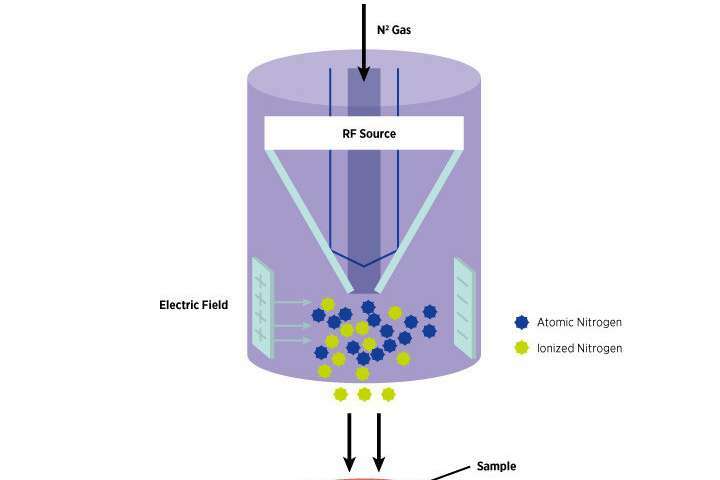 (Top) Schematic of the atomic nitrogen generation process with a RF plasma. (Bottom) Cross-sectional view of bottom-gated monolayer and few-layer WS2 FETs with Ti/Au contacts. Credit: American Chemical Society. Atomically thin, 2-D transition metal dichalcogenides (TMDCs) like tungsten disulfide (WS2) exhibit remarkable physical, electronic and optoelectronic properties, such as flexibility, transparency and semi-conducting characteristics. Although there has been significant progress in fabricating 2-D TMDCs, the ultrathin nature of such 2-D semiconductors precludes the usage of techniques like ion implantation, with subsequent activation annealing, for introducing and retaining dopants within mono- or few-layer TMDCs. Now, Dongzhi Chi and colleagues from the Institute of Materials Research and Engineering and the Institute of High Performance Computing at A*STAR, in collaboration with researchers from the National University of Singapore, have developed an innovative technique that uses highly reactive nitrogen (N) atoms for controlling dopants within films of WS2 at the atomic scale, and promises a reliable method for doping 2-D TMDCs. "[The current] inability to effectively dope 2-D TMDCs hinders developing energy efficient devices like field-effect transistors using manufacturing technologies currently employed in the semiconductor industry," says Chi. TMDCs like WS2 are typically n-type semiconductors and there are currently no reliable methods for making atomically-thin TMDCs that are p-type. This is particularly vexing as it means that 2-D TMDC devices, by necessity, are mostly based on n-type CMOS-FETs—field-effect transistors (FETs) fabricated using complementary metal-oxide-semiconductor (CMOS) technologies. The lack of an effective way to make p-type 2-D TMDC-based CMOS-FETs limits the creation of next generation electronics, optoelectronic devices, and clean energy technologies. So the researchers looked to atomic nitrogen as unlike current doping techniques, such as ion-implantation or plasma implantation, it can produce effective p-type doping in 2-D TMDC-based CMOS-FETs without causing noticeable structural damage. "Unlike other doping methods for TMDCs —such as molecular chemisorption, physisorption and nitrogen plasma doping—our method introduces nitrogen into substitutional sites of sulfur by replacing the sulfur with nitrogen, without causing damage to the TMDC layers," says Chi. "Our work could help to accelerate the development of next generation electronics and optoelectronics technologies, such as ultralow power logic circuits and smart sensors, based on 2-D semiconducting TMDCs," says Chi.